If you are planning a vacation to Montreal with a baby or toddler, you're probably wondering where to stay. The Littlest Passport has ranked the best areas to stay in Montreal with a family - considering baby-friendly accommodations; things to do; access to green space and public transit; and ability to navigate the neighborhood in English (if your high school French is a little rusty). Plateau ranks as best neighborhood for AirBNBing with a baby or toddler. North of Mount Royal, the Plateau and Mile End neighborhoods blend residential apartments with hip dining and shopping. Stroll the tree lined streets, try Montreal bagels at St-Viateur Bagel, and sip a coffee with hipster locals and old Italian and Portuguese men at Café Olimpico before heading on to Mount Royal or another tourist destination. What you'll find: If you want to stay in the Plateau or Mile End with your baby or toddler, you'll need to AirBNB or VRBO. The Plateau offers beautiful homes in the classic Montreal style - with sweeping staircases, colored windows and tree-lined streets. The neighborhood has a real community feel, and you may stumble upon a cultural street festival, or a BBQ at the park/community space Le Marché des Possibles. Not all walk-ups will have air conditioning, and can get stuffy (especially the rooms on higher floors, as heat rises). So if you're traveling to Montreal in the hot summer months, be sure to check that the home rental you're considering has air conditioning to ensure your baby has a good night's sleep. Avoid rentals directly on Avenue du Parc, Boulevard St Laurent and Rue St Denis. These are busy thoroughfare streets with a number of late night bars and clubs (especially the two later streets) - great in your 20s, not so great on a vacation with a toddler. Public transit access: There are a number of bus and subway lines throughout the neighborhood's main north/south streets to shuttle you downtown or to other top tourist destinations. Parlez-vous English? : The majority of people living in the Plateau and Mile End neighborhoods are bilingual, so you shouldn't have much difficulty navigating the area if your French is rusty (or minimal). Outremont is an upscale residential Francophone neighborhood, located north of Mount Royal Park and just west of the Plateau/ Mile End neighborhoods. 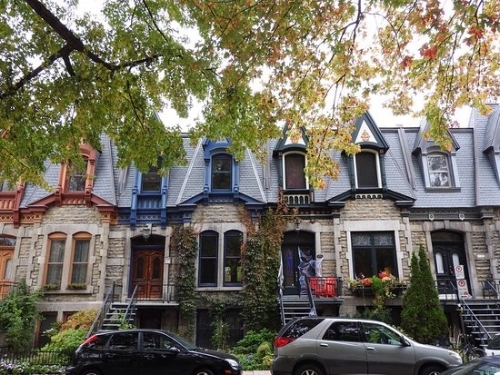 What you'll find: Though you won't find hotels in Outremont, you'll find beautiful home rentals on quiet tree-lined streets, and neighborhood parks and playgrounds dotted throughout. Two upscale shopping and dining strips along rue Laurier and avenue Bernard, where you'll also find cafes and grocery stores. Public transit access: Rent a home close to avenue du Parc if you want a relatively quick bus ride down to Mount Royal, downtown and/or the subway lines (though we recommend not staying directly on avenue du Parc, for a quieter sleeping experience). Parlez-vous English? : Though Outremont is a francophone neighborhood, you can get by with limited French, as many folks are bilingual (though starting a conversation with Bonjour, S'il vous plaît or Pardon is always recommended). Imagine waking up and looking out your bedroom window onto cobblestone streets with European flair. Old Montreal, also referred to as the Old Port, will leave you feeling like you've stepped back in time and over an ocean. What you'll find: Hip boutique hotels, and AirBNB lofts (though you may have to dig hard to find apartment rentals suitable for babies and toddlers). Bigger hotel chains can be found just outside the periphery of the neighborhood. You'll also find beautiful streets filled with shops and cafes; great upscale dining; buskers; a lovely waterfront and green space for playing, picnics, or relaxing; and a ton of tourists in the summer time, while in the wintertime the Old Port of Montreal can feel almost abandoned. Most summers Cirque de Soleil performs in Old Montreal, under the big top (Editor's note: Cirque du Soleil won't be performing in Old Montreal in 2018, but will return in 2019 with Alegria - The Return of an Icon. Public transit access: There are subway options along the northern edge of Old Montreal. All stations are on the orange line, which doesn't connect directly to downtown, so you'll need to transfer to the downtown line at Berri-UQAM (a couple stops east of Old Montreal), or take a bus to get to most neighborhoods that you will want to explore. Parlez-vous English? : As a top tourist destination, you will find no difficulty navigating Old Montreal in English. Unlike other cities, where the downtown core becomes a ghost town outside of business hours, Montreal's downtown pulses with energy. You'll find shopping malls, bars, restaurants, galleries, and a surprising number of strip clubs in the downtown core. It's also home to many cultural festivals in the summer months, particularly in and around Place des Arts, on the eastern end of downtown. What you'll find: You'll have a much easier time finding a hotel than an AirBNB, as downtown residential stock is comprised mostly of apartments inhabited by university students or professionals without kids. These apartments are often studios and one bedrooms, without baby amenities like cribs or high chairs. Depending on where you stay within the downtown core, you may find it difficult to find a nearby grocery store, so inquire with AirBNB hosts or hotel guest services prior to booking, if this is a must-have. Most of the kid-friendly restaurants in the area are so-so, though there are plenty of quick eat options. You won't find playgrounds in this area, but you can take your toddlers to McGill University's campus with it's large green fields if you're looking for a place to safely run them around. The Place des Artes complex also has a shallow fountain that locals dip their toes into while little ones splash around (located in front of Salle Wilfrid-Pelletier. Public transit options: You'll find no shortage of subway stations within walking distance wherever you are in the downtown core. The subway stations are linked to Montreal's "underground city" of malls, office buildings, hotels, cultural facilities and more. Built to spare Montrealers from the frigid winters, being able to go underground is great when Montreal's weather is not as it's finest. Parlez-vous English? : You will have no difficulty navigated the downtown core if you do not speak French - many employees working downtown in the shops, restaurants and hotel industry are fully bilingual. The McGill Ghetto is populated primarily by - you guessed it - students attending McGill University. However, some professors and professionals also live in this downtown neighborhood, just east of the university campus. What you'll find: If you need an apartment rental to come furnished with a crib and/or highchair, you'll probably have a hard time finding one in this neighborhood (bordered by rue University on one side and rue Parc on the other), given that the apartments are occupied mostly by students. However, if you're vacationing with your own travel crib and other baby amenities, you can find some apartment rentals that would be suitable, and surprisingly upscale. On the southern periphery of the neighborhood, along Sherbrooke Avenue, you will find some economy hotels, including apartment style hotels. Restaurants cater to the student set (think fast and cheap). Lola Rosa, in the heart of the McGill ghetto, is a high quality, longtime favorite for vegetarian, vegan and gluten free meals. Cafes are plentiful along avenue du Parc, to caffeinate students during their study sessions, and you'll find a couple big grocery stores along avenue du Parc as well. Because it is home to students (as well as a Canadian Football League team the Montreal Alouettes that play at McGill Stadium), there could be street noise from late night party goers returning home (or football fans leaving the stadium). This can be the case even in the summertime, since many students stay in the city through the summer months. Google the Alouette's home schedule; read guest reviews to gauge whether other visitors have complained of noise and make sure to ask hosts more about the building (its tenants, noise levels, sound proofing, etc) before booking if your baby or toddler is a light sleeper. Much like downtown, you won't find playgrounds or parks in the McGill Ghetto, but you can take your little ones to McGill University's campus with it's large green fields, or to Mount Royal Park which borders the ghetto to the north. 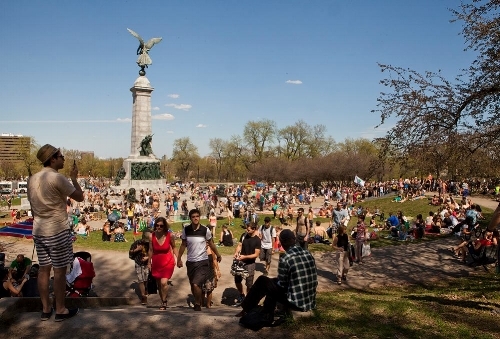 Public transit access: Walk south to catch a subway, or find a bus line on avenue Parc which will take you up to Mount Royal Park, Outremont and the Plateau/Mile End, or downtown towards Place des Artes, a popular cultural venue that is also home to the Montreal Jazz Festival. Parlez-vous English? : Given that it is home to McGill University students, shop owners and hospitality workers are very used to interacting in English. Have you found a home rental or hotel in a neighborhood not mentioned above, and have questions on whether the neighborhood would be suitable for a Montreal vacation with a baby or toddler? Don't hesitate to reach out!